Address: Rua Da Nau 9 Bom Sucesso, Óbidos (Región Centro), Portugal. Located 400 metres from the Óbidos Lagoon, Aldeia Do Pinhal - Holiday Villas offers an outdoor swimming pool surrounded by lawn. It can accommodate up to 6 persons. 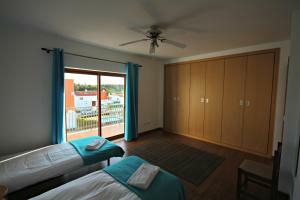 This 2-floor villa includes 2 twin rooms and 1 double room. Every room has an ensuite bathroom with a shower. One of the bathrooms has a bath and some have a bidet. The living room on the ground floor features a dining area, a sofa and a flat-screen satellite TV. The fully equipped kitchen opens to the living room and allows guests to prepare their own meals. In addition guests can find some restaurants overlooking the lagoon 5.6 Km away. Óbidos, known for its wall surrounding the picturesque village and the castle, is 16 Km away. Royal Óbidos Golf Course is 3 Km away and Praia D’El Rey Marriott Golf Course is 9 Km away. Foz do Arelho Beach, on the other side of the lagoon, is 20 Km away. Lisbon International Airport is 90 Km away. Please note that a security deposit of EUR 200 will be charged in cash at check-in. This amount will be refunded upon check-out if no damages are made to the apartment. Please note that the 30% deposit charged on day of booking will be charged on your credit card details. Aldeia Do Pinhal - Holiday Villas will contact guests with further details. The remaining 70% must be paid at the check-in.